As you know, we are a small business: husband & wife, lots of work and good will. Running a small web based business in this economy is not easy, so if you like our blog and all our free resources, here are 10 ways you can help us out. Thank you in advance! Word of mouth is the best advertising there is. Think about those around you who could be interested by French Today: your colleagues, fellow students, teachers… Are any friend or family member studying French? Someone who travels to France? Or someone who enjoys French wine or food? And if you need business cards, just contact us, we’ll send some to you by mail. If you purchased one of our audiobooks to learn French, please leave a review: it’s very fast, and it’s the best way to let people know that our audiobooks are really good. All our reviews come from verified customers. If you have a blog, we’d love it if you could review one of our products. In exchange for your unbiased review, we’ll reimburse the cost of the product to you: contact us for more info. Again, the more comments, the more visibility. It makes us feel good when people tell us they like what we do. It’s very important to us. You have a website, or a blog ? Send us some traffic and get 20 to 30% of the sale generated by your site! Member of the press? We have an interesting story (raised in France, moved to the US for 18 years then returned back to the north of France to simplify our lives and raise our bilingual daughter among our family, self starters, author of 200+ hours of audio…) and a unique approach to teaching. If you feel you have expertise in something France-related, and your are dependable and serious about contributing to our blog, we’d love to hear about it. Contact us. You live in a neighborhood with French restaurants, French bakeries… know of French clubs? Your university has a French department? If you think you could leave a stock of business cards at one of these places, or hang a poster on an information board, it would be awesome! This one is rather obvious… that’s how we make a living! 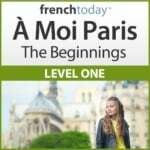 Browse our French audiobook guide to find the best tool for learning French. I personally hand selected these French teachers for their expertise at teaching French, their reliability and the comfort of their home. I’ve been working with some of them since 1999… The customer reviews don’t lie: an immersion homestay in France with one of French Today’s recommended teachers is an unforgettable experience. Each and every one of these steps would help our business grow. Thank you to all our patrons who made moving from a large US city, quitting well paid jobs and returning to France possible. We love our new life close to our family in a small town, and we hope French Today keeps growing so we can raise our daughter close to our loved ones. Mille mercis!! !